Providing cash flow solutions, business financing, and invoice factoring to businesses throughout San Jose, Sacramento, San Francisco and Northern California. 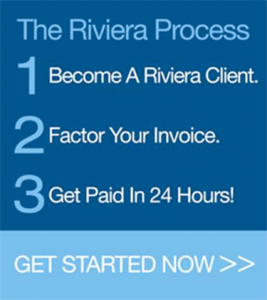 Riviera Finance is an invoice factoring company providing the following services for companies in San Jose, San Francisco, Sacramento and all other cities throughout Northern California. This company, which produces specialty/promotional items for corporations, needed cash to meet an ever-growing demand for their product. Riviera Finance stepped in and helped the company take on new clients and expand its service to its existing client base.